While Forbes had a pretty good article in on Kids Wearables back in March, they missed a huge opportunity in the kids wearable space. Impact tracking! You’re not worried about kids getting their 10,000 steps in when they can’t even walk yet. But you do worry about falls. If you’ve ever parented a little one, you know the drill. You hear a crash, a boom, something that makes your heart stop and you rush into the room where this cacophony of disaster originated. You are greeted with silence, a look, a pause, and then a wail. Because you don’t know whether this boom registered a 8.7 on the Richter scale, you don’t know whether to console or open up a can of “you’re okay, toughen up” love. 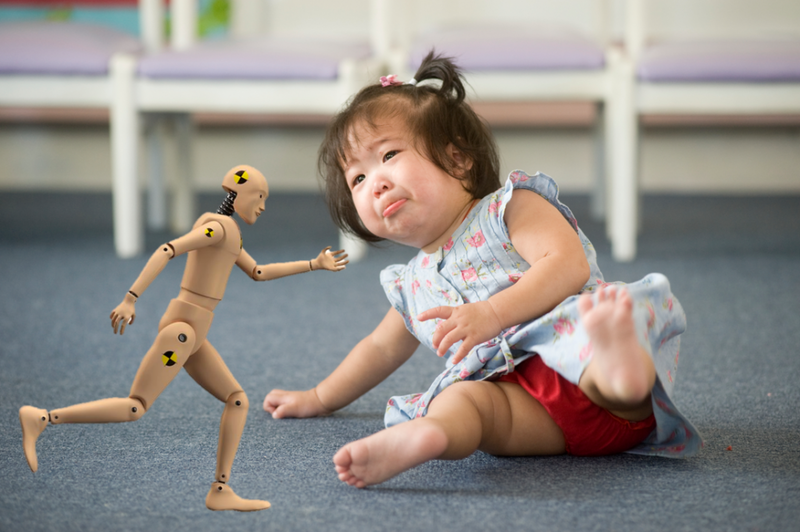 Imagine if we could instrument toddlers with the same accuracy of crash test dummies! Is that a fake cry or did they really hit the floor at 50 mph? So imagine your child is wearing a onesie with more sensors than your average crash test dummy. You could immediately be alerted where they hit, how hard and if it hurts. That critical bit of evidence could be the difference between a calming mosey or a panic sprint to your child. Imagine the tears saved on both sides with this time saving concept in place! Internet of Floats: Thinking about connectivity during disasters	Internet Of Paper Towels: Which one is the quicker picker upper?